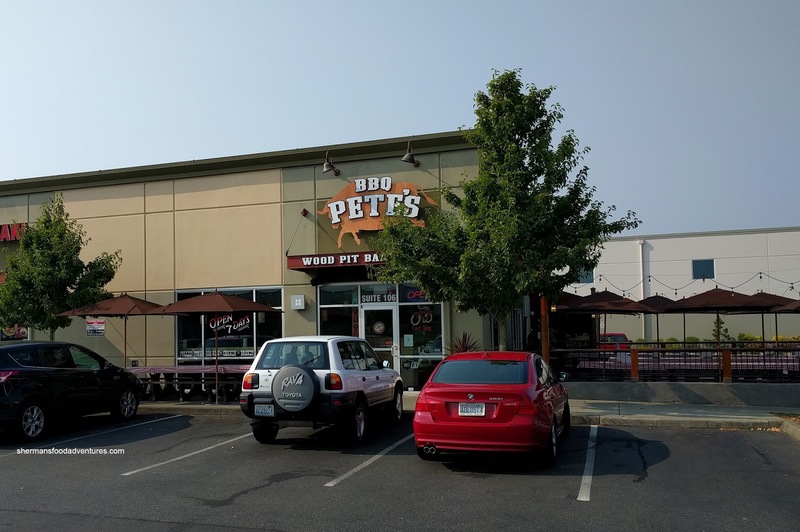 Last May, I traveled down to Kent, Wa (let's just say Seattle since Kent is in the Metro area) so that I could take the BBQ Judge certification course (PNWBA). 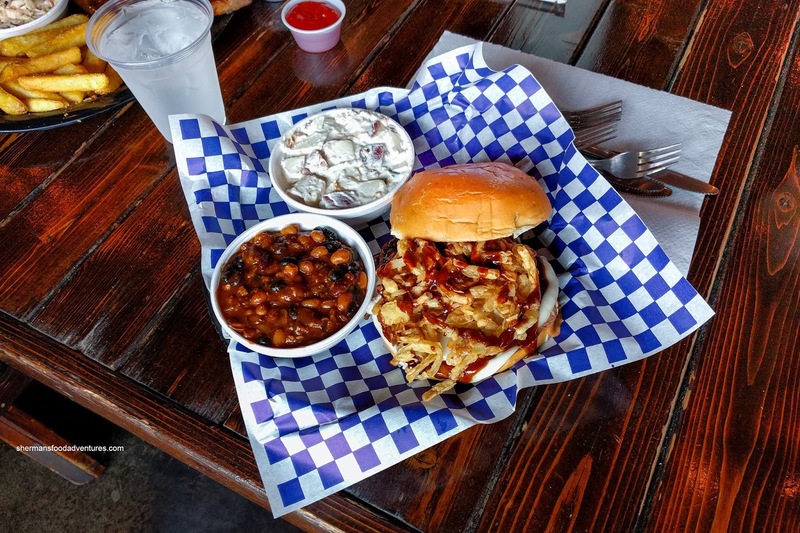 I've always loved BBQ and to actually be able to judge it at PNWBA (and sometimes other associations) events was a bucket list item. We ended up taking the course at the nearby BBQ Pete's just a bit past Southcenter Mall. I never did get to eat there, but since we were out there again before our flight to San Francisco, it was as good as any. 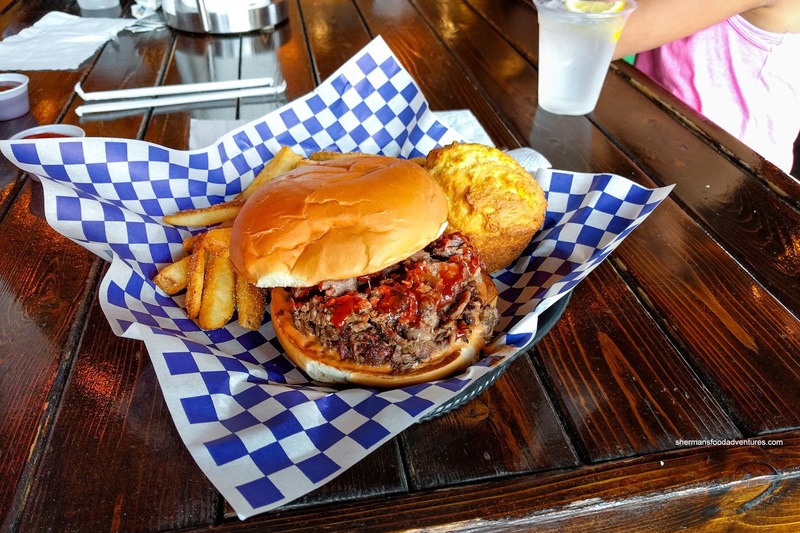 For my son, he loves brisket, so it was by no surprise that he chose the Chopped Brisket Sandwich with Corn Bread Muffin and Fries. They didn't skimp on the brisket as it was bursting at the seams. It was tender while conservatively sauced. There was a definite peppery slant while some tang and smokiness. The bun was soft, but held together. Crumbly with a balance between sweet and savoury, the corn bread muffin was delicious especially with the honey butter. Viv and my daughter shared the Sandwich with No Name featuring sliced brisket, crispy onions, provolone and BBQ sauce. This was also tasty with tender smoky brisket and sweet fried onions. However, the sides were the real star. The Loaded Potato Salad was made with sour cream, bacon and onions. It tasted great like a baked potato with a nice tang, smokiness and creaminess. The BBQ Beans were also money with a rich sweet depth that wasn't overwhelming. Again, the smokiness was there while the addition of sweet corn was genius. It broke up the monotony. For myself, I had the 3 Meats consisting of BBQ Pork Ribs, BBQ Pork and BBQ Chicken. 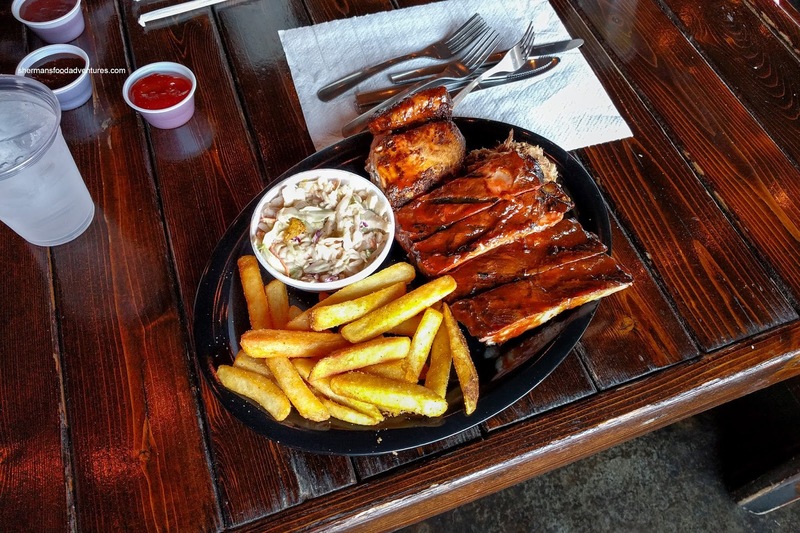 I found the ribs to be meaty and succulent with a hint of smokiness. It wasn't sauced aggressively and that was fine since we could help ourselves to 6 different sauces. 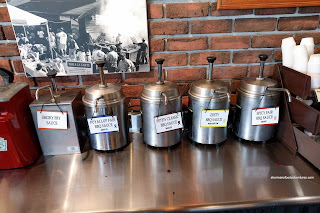 The BBQ Pork (pulled pork) was fairly moist and came plain for us to sauce ourselves. Usually, BBQ Chicken doubles as jerky, but not this one as the breast meat was moist and tender with rendered skin. For my sides, I had the fries and Chipotle Coleslaw. The slaw definitely had a kick to go with equal parts tang and creaminess. Once done, we helped ourselves to the complimentary soft-serve ice cream (which was pretty average, but hey, it was free!). As for the rest of the food, it was more than acceptable.